iPhone and iPod touch software, games, toys, calculators and web applications by Kudit: So, multiply by 2, divide by 10, adjust for service, what am I doing here again? So, multiply by 2, divide by 10, adjust for service, what am I doing here again? Kudit is proud to announce the Tips calculator. 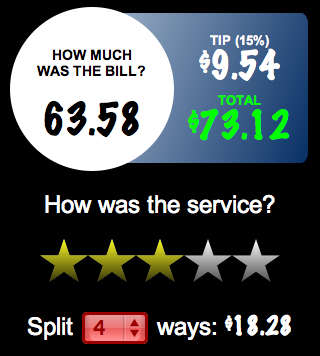 Calculates the tip based on your rating of the service. Settings screen allows you to customize the percentage associated with each star and Kudit remembers the settings for you, so all you have to do is click and tip!